There are a number of legitimate reasons why it's hard to identify a vintage Hamilton. Hamilton was known to use "what fit" in times of great demand and short supply. Hands and dials didn't always match what was originally defined for the model. In addition, Hamilton had an awards division that assembled watches for companies to use as presentation watches and the customers didn't want their recipients to find the exact same watch in their local jewelry store. Of course, it's also possible that the watch in question is a "franken" and assembled from parts or it was recased at sometime in it's life. Hamilton's movements were so well-made they often out-lasted their original case. In any event, regardless of the cause, sometimes you come across a very legitimate watch that is not shown in the catalogs. I recently received such a watch. This watch came to me from a fellow collector... it is a family piece so there's no reason to suspect it was jury-rigged from spare parts. I've also seen other identical examples so I'm 99%+ confident that it's legit. The watch was not running and it rattled a little more than an automatic usually should. Auto's always make a little noise when you shake them, but they shouldn't rattle. When I try to identify a watch, I look at the case material, dial pattern and shape of the lugs. The type of hands is a good attribute to match too. 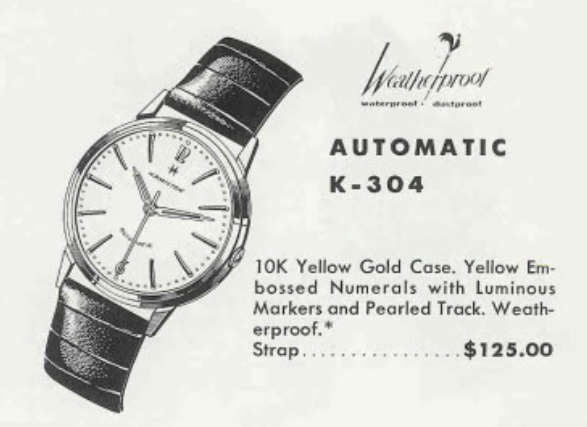 The best I could do with this watch is match it to a 1960 Automatic K-304. There's a couple of problems with my match... first of which is the K-304 is solid 10K gold. But the dial layout and hands are a good match. My mystery watch has an original dial and it is has silver embossed numerals and markers - so it's not a recased K-304 either. It looks a lot like Accumatics from the early 1960's so I suspect it's in that family. When I opened the watch I found both of the dial foot screws had come out. One was broken. So the rattling was the movement coming away from the dial and hitting the case. That will also stop the watch if the hands hit the dial. Inside the watch is a Hamilton 689 - which would be consistent with a 1960 era watch as well. The oscillating weight and it's carrier are held on with just two screws. Once the rotor assembly is removed, the watch looks like your garden variety manual winder. While everything is being cleaned, I'll prep a new crystal for installation. This watch takes a 30.8mm diameter PHD crystal. The cleaned and reassembled movement goes onto the timer to see how well it's running. It's running just a little slow over 24 hours but the beat error is a smidge high. Fortunately, this movement has a moveable hairspring stud so I can easily adjust the beat error as well as the beat rate. First I adjust the beat error - that means I move the hair spring stud so that I can effectively rotate the balance and center the impulse jewel on the balance with the pallet fork. That will allow the balance to swing the same distance in both directions. With the beat error reduced to a very acceptable 0.3ms, I'll tweak the regulator to speed up the watch slightly. The regulator adjusts the effective length of the hair spring... the shorter it is, the faster the watch will go. A new crystal and a nice strap compliment the watch nicely and complete the overhaul. The true identity of this family heirloom will remain a mystery but at least the current generation of caretakers will be able to use it again. Can you tell me watch the name of a certain watch? I can't send picture of this Hamilton in this portion. Probably but I would need to see it. I can read minds but only from 2 feet away. So you'll need to send me a photo. You can reach me through my Etsy shop or by clicking the "Click Here" above my photo in the upper right. All fixed up around $250 or more. As a project watch in need of restoration, $75 ish. Basically it depends.